In 1980, Laura Meade, CEO founded Universal Heating, Air Conditioning & Plumbing. Being a woman-owned company presented challenges of it's own but these were overcome with honesty, providing quality products and professional service. With this leadership she has promoted the success of the company through a simple formula - customer satisfaction. Today, you can be certain your heating, air conditioning and plumbing needs will be cared for promptly and effectively. Steffen Meade, President, coming up through the ranks, working on installation and repairs, along with his staff, continues to manage and operate the family business with a hands-on approach, for your worry-free comfort and convenience. His training, education and lifelong commitment to the same values holds steadfast in the success of Universal. 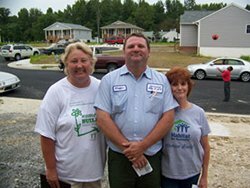 For over 15 years, the knowledge, experience and dedication of Chip Barden, Master Plumber, has added to our success. From the moment you meet Chip and throughout the job, you know you are working with an expert who knows what he's doing. Whether it's leaking pipes, replacing fixtures for new kitchens, or general home plumbing Chip has everything under control. Our staff is continually trained in product and procedures, and ready to service the greater Richmond and surrounding counties. Call us today and discuss your heating, air conditioning or plumbing situation and we'll show you a solution. We have a fleet of fully equipped and radio dispatch service trucks to ensure your repairs or installations are completed in a minimum amount of time, with maximum, expertise. Universal has employed the same professional staff members for 15 years, which signifies our stability as a company, but more importantly, imparts the sense of family to them and, thereby, to our customers. An accredited company, carrying an A+ rating with the Better Business Bureau and served in the capacity of an Advisory Board Member for many years. We also believe in giving back to our community. 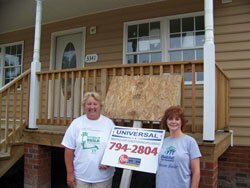 Here are just a few ways we step up to help our neighbors: Universal is privileged to be part of Habitat for Humanity. We were the only company to donate and install the heating and air conditioning system in a recent build. Universal has been actively involved in The Hospital Hospitality House of Richmond. The entire community is here to help, to give patients and their families "a place to call home" during their stay in Richmond. Our CEO, Laura Meade, served on the Advisory Board of Commonwealth Bank / First Community Bank, for many years. Partnered with ALTRUSA of Capital City, delivering food baskets to the elderly.